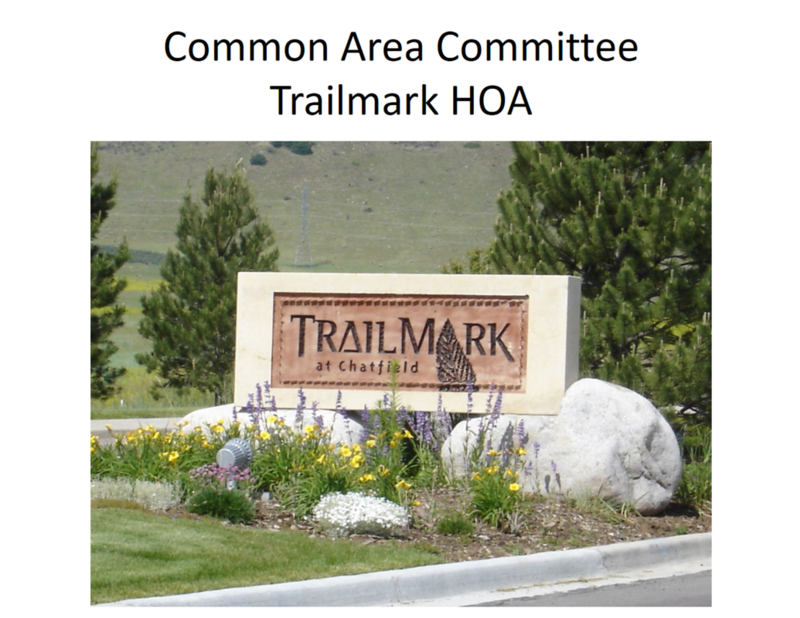 The Committee shall meet regularly to evaluate the common areas in TrailMark and to take action to maintain and improve those areas, so as to provide a more beautiful and safe place to live, and to raise the quality of living for the community. Work with the Design & Review Committee, Finance Committee, and other committees as appropriate on safety, aesthetic, growth and public domain issues. Contact commonarea@trailmarkhoa.org for more information or to volunteer your time. 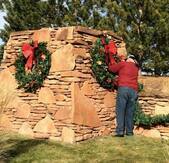 We hope you enjoyed the Christmas decorations at the entrance to TrailMark. We contract to get the tree lights installed since they became too tall for us to decorate ourselves. Our committee still does put up the garland and the wreaths every year. Our landscaping projects will commence this spring, so until then enjoy the snow and the moisture it brings to all our trees and plants. The landscape project at the north side of the entrance to TrailMark and the first median have been completed. It will look even better in years to come once the plants have matured and covered the areas intended. The HOA has budgeted enough funds to complete all the medians next spring, so you can expect everything to look a bit more attractive as you drive down TrailMark Parkway and Independence. South Suburban is doing a great job keeping up the trails, even after a downpour of rain. You can help by carrying a plastic bag and picking up anything that does not belong in our beautiful natural environment. Believe it or not, there is a landscaping plan for TrailMark. We also have budget constraints that do not allow us to do everything right now. We are starting at the entrance to TrailMark on the Parkway. The areas to the north are about to be improved dramatically, followed by the completion of the first median closest to the entrance. We have 13 medians in TrailMark. Next spring with a new budget year we plan to enhance the medians with plantings and fresh mulch. On the corners by the monuments we will be adding additional mulch and covering up the irrigation hoses that have been exposed. We appreciate your patience as we continue to work within our budget. The parking strip on the north side of TrailMark Parkway is planted as the original landscape architect intended. You will notice tall (Carl Forester and Maiden) grasses between the sections of irrigated and non-irrigated grasses. The non -irrigated native grasses do grow tall and look very natural between the three mowings a year. This is an intended appearance, and part of what makes the TrailMark community more of a natural open space. No it is not all bluegrass and it is not as manicured as Highlands Ranch by design. You may have noticed the overgrowth of alfalfa by the Hogback Hill sign that got a bit out of control. It is a reminder that this used to be a ranch. Aside from acquiring a small herd of pygmy goats to eat the alfalfa, we are making plans to address the alfalfa and the mowing so the sidewalk will remain friendly to pedestrians. June and July are the big growth months for the lawns and the weeds. It is a challenge keeping up with the mowing of the native grasses, which are only mowed about 3 times a year, and keeping the weeds under control. South Suburban mows the native, and Mountain High Lawn and Landscape mows the rest, including the bluegrass. You may have noticed along TrailMark Parkway on the north side, every other section that is left natural is also not irrigated. We have planted tall grasses in between the sections so they are more delineated. Just had an annual meeting with South Suburban Parks and Rec District. George the arborist says that the emerald ash borer is still a ways north of us, but the lilac ash borer could be infesting and killing your ash trees in TrailMark. They can be treated by an arborist, so check out any you may have on your property. The Japanese beetles are infesting some linden, crabapple and some elm trees. Check the leaves of your trees and if they are eaten leaving only the stem, you may have a problem. Pinewood nemotodes, a microscopic worm has been infesting some Scotch and Austrian Pines in the Lone Tree area. None have been discovered yet in our area, but let us know if a pine tree dies. They do not affect the ponderosa pines, which are more native to Colorado. An Austrian Pine has a cluster of three needles in a clump. The ponderosa pines have only two needles to a clump. We have both types here in TrailMark in various locations. If your yard backs into open space, and you have a tree or two that are on common areas, please help out the irrigation and water them yourselves. Many areas have irrigation, and often it is inadequate for the weather conditions. Examples are long hot spells like we are having now, or dry cold winters without much moisture, whether it be rain or snow. If you like the trees and enjoy them behind your house, even though they are in open space, please give them some additional water. Please! 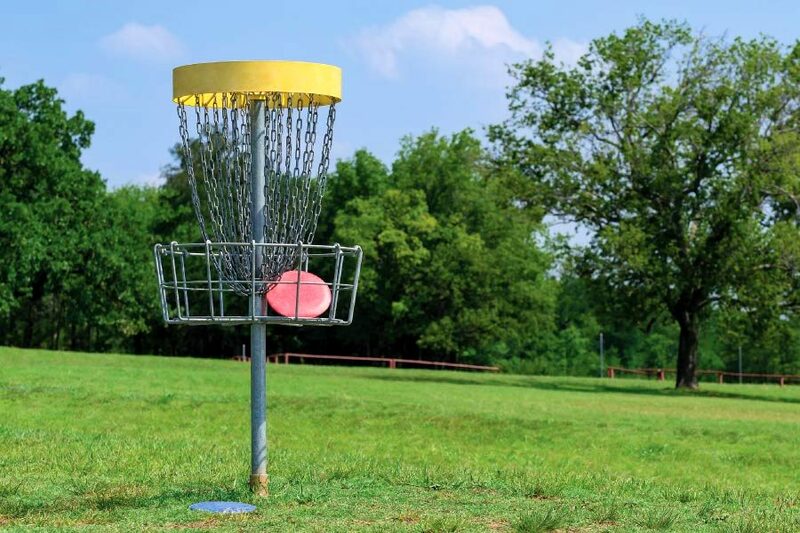 We are thinking of adding a nine hole Frisbee golf course to the open area to the west of the shelter in Hogback Hill Park. Please let us know if you think that is a good idea or not. We will also, eventually, be expanding a new trail from the parking lot to the viewpoint benches at Sled Hill and then on to the east to connect to the regular trail. You all may have noticed that we have new benches on the east and the west on the trail around Fairview Reservoir! Working with SSPRD, we have also added two new benches overlooking the sled hill to the north of the Hogback Hill Parking lot. These are a great vantage point to relax and view the Botanic Gardens to the northeast, and watch your children slide down the sled hill for those winters when we get enough snow. There are no trails out to these benches as yet, and hopefully they will be cut in next year. Privacy Fences along TrailMark Parkway and Independence are due for replacement in the next year or two. Currently we are trying to decide whether to replace the fencing as it currently appears, along with a regular painting and maintenance schedule. Or possibly to go to a TREX type of fencing as you can see in many parts of Highlands Ranch. This will not require painting on either side, and should resist decaying at ground level. The third option is to change it up to a concrete type fence, which some varieties can be seen along our freeway systems. It is a substantial investment for our community and costs are split between the TrailMark HOA and the TrailMark Metro District (TMMD). If you have an opinion, let’s hear from you. We are continuing to beautify and enhance the landscaping in TrailMark. A good noticeable place to start is on the north side as you enter TrailMark. There is a bed that is approximately 25 X 80 feet that we will completely redo by adding color and interest. Then we will move to the raised wall area and put in plants in the first 4 feet that are visible from the road. From there, we will begin to enhance the medians starting from the front of the neighborhood and continuing to the Filing 5 area. We are only limited by our budget each year, and we will get as much done as budget allows. As I write this note, it is EARTH DAY! Hopefully as you were walking the trails today, you brought along a plastic bag and gloves to pick up trash on your walk. Of course, you can do that any time you take a walk and help to keep TrailMark litter-free. Every day can be Earth Day!! It seems like the windiest day of the week is always trash-day-Tuesday, so it is very important to make sure you have a secure cover over your trash and your recycle bins. You may have noticed that the benches on the east side of Fairview Reservoir #1 are missing. SSPRD is going to replace them with new benches with shoe scrapers for the fishermen walking in the mud. SSPRD is also adding a bench on the west side of the reservoir. ​No tree cutting is allowed on any open space property, including the area around the “Beaver Pond,” which is Fairview Reservoir #2. Anyone caught doing so is subject to fines or worse, so don’t do any cutting. We have been turning on the irrigation in the open space. Please notify the HOA Board of TrailMark if you see any irrigation issues. Enjoy the flowering of spring. Some of you may have noticed that there are two benches out at the top of the sled hill. This is news to many, because we did not have much snow until last weekend. The plan is to work with South Suburban Parks and Rec District to erect two permanent benches at the top of the sled hill. Eventually we will build a trail from the parking lot to the top of the hill, then on to the East to connect to the trail heading north into the open area. We hope you enjoy having a place to sit while the kids enjoy Hogback Sled Hill. With the changes to the trash containers, it is a good time to remind everyone that it is required that even their recycling is in a container with a lid. This will prevent any winds from spreading trash and any foraging animals from disturbing the trash and making a mess of your yard and our open space. Enjoy our beautiful Colorado Winter. The Christmas Lights are up and look better than ever. We hired a new company this year, and for a little less money as well. We have had challenges getting the electricity to work on the North side and on the Island by Fairview Reservoir. Hopefully these will be resolved soon. For many years before the trees got too tall, our committee hung the lights on the trees as well as doing the garland and wreaths, but they got too tall for us to safely accomplish this. We hope you enjoy them into early January. We still hang the garland and the wreaths. The CAC will begin a beautification of the entry way this spring given the weather conditions. Yet this year, we are planting four trees to replace those that have died. We will also be treating all the ash trees against the ash borers in the early spring. It would be a shame to lose the 36 ash trees that we have. ​We will also be working with SSPRD to place two benches at the top of Sled Hill to the north of Hogback Hill park. Not only will they be great to have during sledding this winter, but they also provide great vistas to the north toward Botanic Gardens. One of the benches will be to honor one of our CAC members, Lesa Rangel, who passed away last month. (The star in front of the Christmas lights on the island by the fire station is also in her memory, as she decorated with the CAC for 13 years.) We are also working with SSPRD to provide additional trails to the benches from the parking lot, and a connector to the trails just to the East of Hogback Hill Park. This will be a phased project. We are in mid-summer and bushes and trees are looking good. South Suburban and Mountain High Lawn and Landscape mowed all the common areas along TM Pkwy at about the same time this year. The tall grasses on the North side of the parkway are getting tall and marking a distinction between native grasses and bluegrasses just as the original landscape architect intended. We are going to begin improving two of the medians that look very barren right now. This is an ongoing project that will eventually include all the medians that do not have plantings already. Our goal is to add some interest, some color and not impair the sight lines for safety. It is always a challenge to keep the lawn green and be wise about water usage. It was a tough winter for many grassy areas, so be patient and understand that we do live in a relatively arid area and cannot expect golf-course green. There is a survey on the HOA’s Facebook page about the potential of placing some fitness stations along some of our trails. The survey is to judge the level of interest only but does not discuss the details of how the equipment will be funded, who will maintain it nor the potential impacts to the community. Let’s hear from all of you. We’ll see you at the Concerts in the Park or at the Food Truck Thursdays. Winter was pretty quiet for the Common Area Committee, since there are not many landscaping activities. With the recent winds, you may have noticed some sections of fence have blown down. They are in the process of getting replaced if the weather cooperates. We have not heard of any complaints about snow not being removed on sidewalks etc., so we are assuming that things are good in the area as well. We have contracted with Swingle Arborist Company to do trimming of trees in a three year, three phase plan. Some trees need trimming in the dormant phase during the winter, and others during the full leafing season of late spring. The goal is to manage the appearance and health of all our trees in our maturing neighborhood. Also, during the spring you may notice a boat on Fairview Reservoir #1, or #2 or Pond G. We have Aquatics Associates, Inc. to manage our ponds and water quality which requires them to be in a boat on our ponds. Be aware that they are authorized to operate that way by our HOA and South Suburban, and no, you cannot take any boats or flotation devices into the ponds. Enjoy the peace and beauty of winter. Would bicycle racks at Hogback Hill Park and TrailMark Park (playground) be used? Please let us know your feelings. One response per household, please. Responses will be sent directly to the Common Area Committee. Originally posted February 26, 2015. Re-posted May 15, 2015.